I have already missed a week. I'm barely making this Friday's deadline. Perhaps a regular column idea wasn't the best. 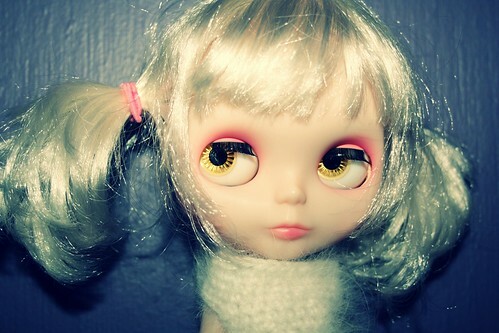 Right now I am hooked on customizers and these are five that I would someday love to own a custom doll from. Her girls are so vibrant and beautiful, and I love the lids she does! Camillaeatfiftyeggs' Photo! I want this girl!!! Again, gorgeous lips, lid work, and just really impressive work on all the girls. I am pining for one of Frankie's girls that Camillaeatfiftyeggs is selling. I am happy to say that I own a custom by her! 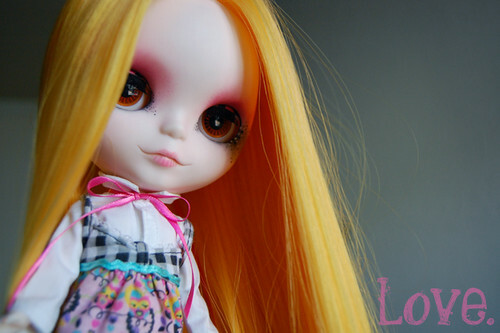 I bought my little ADG Kylee second hand and in redone but scalpless condition. The faceup on this girl is so natural and beautiful, you wouldn't even know she was a doll. She has the most subtle lips and freckles...and Moofala does a wonderful job on each of her girls. Her girls are famous and gorgeous. The girl in the photo is a charity auction for Japan. She is generously giving 100% of the proceeds to the Earthquake/Tsunami Relief Fund.